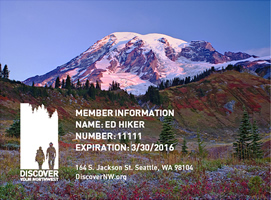 With 70 trails each rated on a scale of 1 to 5 stars, this compact and easy-to-use hiking guide offers some of the best day hikes of Mount Rainier National Park. Detailed trail descriptions and clear directions make this hiking guide an essential resource for anyone planning a day hiking trip. Included are difficulty ratings, easy-to-read topographic maps and elevation profiles, information on flora and fauna as well as historical trails, and quick-reference icons that will tell you whether a trail offers exceptional views, is kid or pet friendly, optimal for wildlife viewing, historic, saved, or endangered. If you're planning a day trip to Mount Rainier, don't leave without this book! Features: Paperback. 2008. 227 pp. Many black and white photos and trail maps. 5 x 7 x 0.5 in.